Liberal candidate Moon Jae-in has claimed victory in South Korea's presidential election on Tuesday after exit polls show he captured more than 41 percent of votes. It was a landslide victory for Moon, 18 percent ahead of conservative rival Hong Joon-pyo, although the results are expected to be officially announced Wednesday morning. Moon's new administration will immediately take charge after the election, due to the impeachment and ouster of former president Park Geun-hye for her involvement in corruption scandals. A 44-year-old female Seoul resident who voted for Moon told the Global Times that she believes Moon has a decent personal image and upright policies, which contrast sharply with that of Park. "I think Moon will improve South Korea's ties with China and lead the economy into recovery," she said on condition of anonymity. 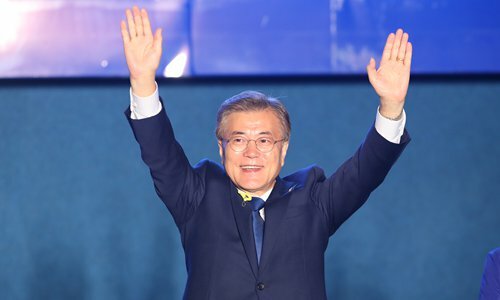 "The South Korean public hopes that Moon, who doesn't hold an anti-China stance as the conservative candidates do, will improve South Korea's ties with China. The country relies on exports and China is its biggest trading partner, with a bilateral trade volume far ahead of all of its trading partners," Lü Chao, an expert on Korean studies at the Liaoning Academy of Social Sciences, told the Global Times. Many believe Moon will also help in easing tensions on the Korean Peninsula because of his moderate views on North Korea. He is known as a supporter of the so-called "Sunshine Policy" which encourages engagement with Pyongyang. Moon advocates dialogue with North Korea, a shift from the current policy, and is also expected to reform the family-centered South Korean conglomerates that dominate the country's economy. Collusion between government officials and businessmen is South Koreans' biggest concern, especially after the country was rocked by the corruption scandal. But revitalizing the country's economy is more urgent for the new administration, Lü said. To diffuse tensions on the Korean Peninsula and to work out a reasonable solution to the deployment of the Terminal High Altitude Area Defense (THAAD) anti-missile system will be crucial to improving South Korea's relations with China, though it will be a tough nut to crack, Chinese observers said. Chinese foreign ministry spokesperson Geng Shuang told a press conference on Tuesday that North Korea will send a delegation to Beijing for the Belt and Road summit to be held on May 14-15, a sign of eased tension since the recent height of crisis. During the campaign, Moon repeatedly said that the US should leave the deployment of the anti-missile system to South Korea's new administration, instead of hastily pushing through its implementation. He urged the US to respect South Korea's democracy, and analysts said they consider this his tendency to push for an independent foreign policy, which has gained him support from young South Koreans. "One of the biggest problems with this THAAD deployment decision was that it lacked a democratic procedure, which has divided the nation and aggravated foreign relations," Moon was quoted as saying in an interview with the Washington Post published a week ahead of the election. "If the same were to happen in the US, would its government have acted unilaterally without the consent of Congress?" he asked. "It shows his policies are independent and popular. This will also help him balance South Korea's relations with China and the US," Zheng Jiyong, director of the Center for Korean Studies at Fudan University, told the Global Times. Sino-South Korean ties have sunk with the THAAD deployment, as it is believed that the system, said to only target North Korea for its nuclear and missile tests, will also monitor military maneuvers on much of the Chinese territory. A liberal administration will also affect ties between South Korea and the US, as Moon's party has a totally different governing philosophy than its conservative counterpart. "The differences on the deployment of THAAD, the sharing of US military expenses in South Korea and the Free Trade Agreement between South Korea and the US will all have to be placed on the agenda with the new president taking office," Dong Xiangrong, a research fellow at the National Institute of International Strategy of the Chinese Academy of Social Sciences, told the Global Times. But the South Korea-US alliance remains unbreakable, analysts said.